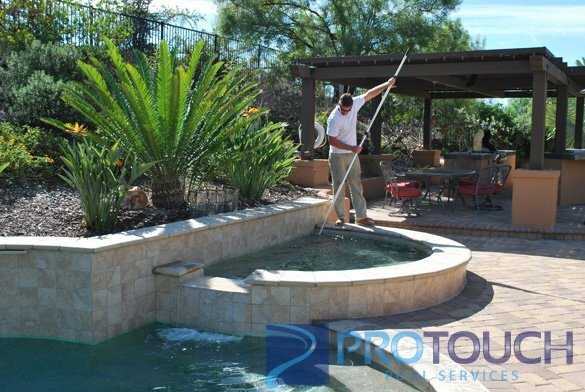 This is a pool and spa cleaning service customer in San Diego County. In preparation for a pool party in The Crosby Estates of Rancho Santa Fe we cleaned the pool free of charge. The swimming pool with an attached hot tub became a weekly full service account after we repaired the pool lights and cleaned the filter. They were happy with our pool repairs and accepted our offer to service their swimming pool and spa. The pebble surface in both the hot tub and pool is vacuumed fully each visit. Brushing the pool tile is also part of our weekly maintenance. Although the swimming pool has a raised bond beam which runs along the back of the swimming pool we are still able to maneuver around the entire pool. The tan concrete coping and pool deck consisting of brick pavers make servicing the swimming pool safe for our pool cleaning technicians. When we first cleaned the pool and spa the water was slightly cloudy and the water was out of balance. The proper pool chemicals were added and the water was clear and safe for the pool party. Along with our weekly pool service in The Crosby Estates we also offer pool and hot tub repairs as well as various pool and spa restoration services. We offer these pool services and pool repairs throughout San Diego County.